If you are like most teachers out there you dread when the announcements come on and it’s going to be an inside recess. This happens more often in the winter time when the temperature is just too cold to be outside or when it’s raining. Why do we all despise indoor recess so much? When asking teachers, their answers included “the students just have too much energy all day” and “I feel like I am doing so much disciplining during recess time because students are doing things they’re not supposed to be doing.” After attending the Physical Literacy Conference and hearing about indoor recess kits I knew that this could have a positive impact on our students and teachers. The different equipment varies on the grade of the students. We also include multiples of some of the smaller equipment. Once teachers receive their bins they label them with their room number and inventory is done each year. As with implementing anything new into a school there needs to be some organization done. At first the school is going to seem even busier at recess time because kids are going to be moving around. Try to remember that this is a good thing! Our kids are moving around, getting active and having fun. From a supervision stand point, I have found it a lot easier to supervise students playing a game or using a piece of equipment from the kit. Teachers need to make an effort to show students how to use the equipment safely and responsibly. There have been less behaviour issues during recess and students are still able to get out their energy so it does not affect their learning during the day. 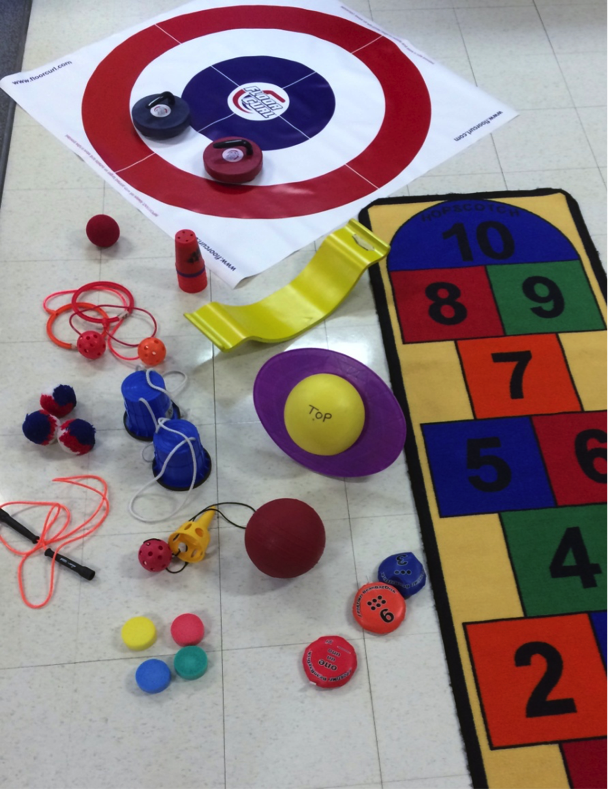 Many teachers also use the resources in their kits to help engage students in movement throughout the day! How do I get these for my school? As you can imagine, depending on how big your school is, these kits can get expensive. If you do not have the funding try to start small and look for agencies who may be able to donate equipment. Some of these things may even be able to be purchased from a dollar store and therefore are easily replaceable if they get lost or damaged. Approach your school division, administration or your physical education consultant and ask for some help. Often times it just takes asking a question and having a plan. Here are some good websites for suppliers with some great equipment. Check out the videos below to see what students and teachers have to say about Indoor Recess Toolkits and get a look at what has been working for them.